Vote: Hot or Not? 2015 Mustang GT in Triple Yellow! 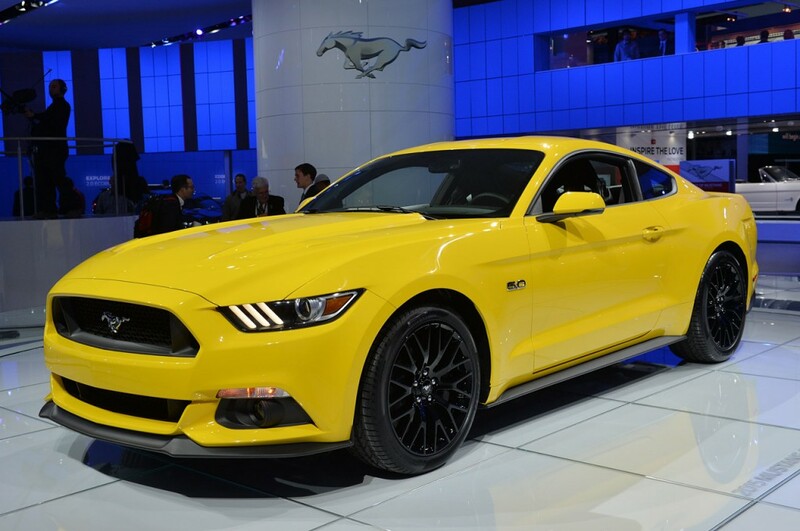 The 2015 Ford Mustang made its entrance felt at the opening day of the Detroit International Auto Show yesterday with a vibrant, Triple Yellow painted 2015 GT coupe. It’s time to vote and let everyone know what you think of this new car featured in such a strong color! These first Triple Yellow Images from MustangsDaily bring you a new color for 2015+ Mustangs. As expected, with a new generation of America’s premiere ponycar also comes a new lineup of color options for 2015. While Grabber Blue and Godda Have It Green were two flashy and very popular color options for the S197, the S550 offers colors like the Triple Yellow you see here and the ever-popular Competition Orange paint job made famous by the 2003-2004 Terminator Cobras. In fact, Competition Orange was voted the Best Mustang Color Of All-time by a wide margin. Given that, it’s logical to assume Competition Orange is going to be in high demand when the 2015 Mustangs start rolling off the factory lines, but what about the new Yellow? This is the world’s first look at Triple Yellow on the S550 platform, and it certainly did make its presence known. The 2015 Mustang GT is supposed to have performance numbers that put it right next to the 2012-2013 Boss 302 around the track, helped in part by borrowing many parts from the Boss. Wouldn’t it be nice to see another epic GT vs Boss 302 showdown, this time with a School Bus Yellow Boss 302 (The last yellow offered on a factory Mustang) vs. a 2015 Triple Yellow GT? Yeah, agreed. Not sure why Ford had to do that. I too originally thought “Triple Yellow” was referring to a yellow vert with yellow interior until checking the 2015 paint options again. I heard the triple part means there’s 3 coats of yellow paint to make it super yellow. I have a screaming yellow 06 and you can tell how crappy the paint and how much nicer the extra coats of paint make it. Just noticed something new when looking at pictures on Ford’s 2015 Mustang preview page. The top down shot of 5.0 Coupe shows a high aspect ratio well in the dash cover on the driver’s seat. Inside the well there is an mistakable glimmer of multicolor projector lens- HUD will be an option for 2015! one comment on the article, the last yellow was not Yellow Blaze, but the 13′ School Bus Yellow! Lol I would know because I own one, however this 2015 is an amazing car, can’t wait to see it myself at the show saturday! Corrected, thank you. I have a feeling you won’t be disappointment on Saturday. I’ve always been partial to convertibles, but I definitely like the 2015 as a coupe over the vert. There’s just something about the fastback look that sets the rear off. Hopefully you get to see both–it really is one of those cars you need to see in person. I am a little underwhelmed with the color pallette. This yellow is nice, and we all know people love the orange and DI Blue. But what’s with having two colors as similar (and dull) as Guard and Metallic? So far very hard to even tell them apart. Add in Silver, Black, and White, and that’s five of the 10 “colors” that aren’t colors at all. Just shades of gray. Had there been a lighter blue (something like the old Regatta Blue from Fox years), or had Guard turned out lighter and more green than gray, that might have been nice. As it stands, I think I am looking at another Oxford White Mustang. That will be my fourth Oxford White and this will be my seventh Mustang.